If you would like to join one or more of our adult sports leagues next season, sign up or contact us to find out more information. Red Stick Area Kickball (RSAK) was founded by Scott Murry in 2005. 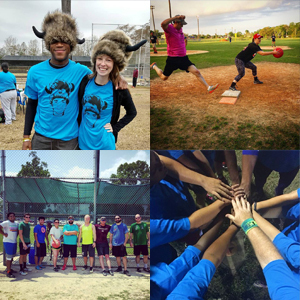 We offer the best experience around in both recreational and competitive Coed Kickball. We offer 4 leagues at various levels throughout the 3 seasons we play each year. We also offer our players many social events throughout the season. If you're interested in making friends, having fun and playing kickball, Come play with RSAK! Summer season starts June 4th! 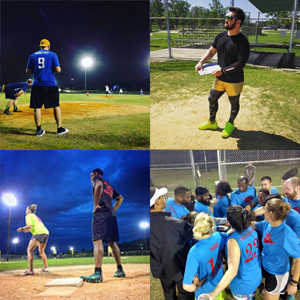 In the Summer, RSAK offers kickball for players of all levels on Tuesday nights! More detail on each league can be found on the league registration pages. Women's: a league just for the ladies! This is a 7 week regular season league with a playoff weekend. 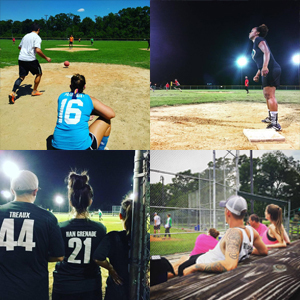 All kickball teams will either register for this summer season as Classic +, Upper (Classic 1), Lower (Classic 2, or LITE) or New (New Team Only league) *Please note that some higher level classic 2 Teams may qualify for upper based on past season performance and/or updated rosters. RSAK reserves the right to move your team up or down a division to ensure fair play and a fun atmosphere for all kickballers. No Classic+ players will be permitted to play in the Classic 2 or "New Team" Divisions. As of right now, ALL REGULAR SEASON GAMES WILL BE PLAYED ON TUESDAY NIGHTS. We have one official rain-out date built into the schedule, and will add in rain-out games on other nights if needed/possible. We always to our very best to make up ALL games. IT IS POSSIBLE THAT WE MAY NOT BE ABLE TO PLAY ALL RAINED OUT GAMES, WE WILL DO OUR BEST TO RESCHEDULE. NO REFUNDS WILL BE ISSUED DUE TO GAMES CANCELLED BEYOND OUR CONTROL. Rain-out in games extreme situations could be scheduled on Wednesdays if fields are available. No team, no problem! Free Agents welcome in all leagues! We will match anyone who wants to play with a team. High Quality Adult Recreation in Baton Rouge, Louisiana.